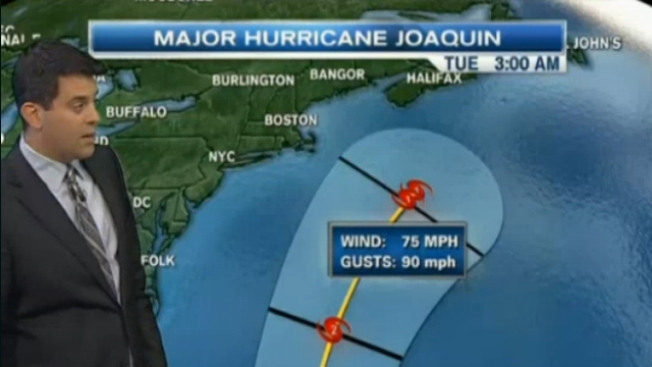 Yesterday, our necn Weather Team explained that Hurricane Joaquin was likely to track either on the left or right side of the National Hurricane Center cone, but unlikely to head directly into New England. Today, the official forecast track has shifted eastward, keeping the storm offshore, with its closest pass Monday. Though this is still from a few days out and the storm will be monitored, the trend is a positive one for keeping Joaquin away from New England and the Eastern United States. Emergency management officials in Massachusetts, Maine, Rhode Island, Connecticut and Vermont all say they're getting ready just in case, checking with power officials and getting crews ready in case any storm related debris needs to be removed. Residents are also being urged to stock up on any needed supplies, including bottled water, just to be safe. Joaquin was still battering the Bahamas on Friday. Slow weakening of the storm is expected to begin Saturday. Today (Friday): Some showers, rain southeast, highs 50s. Tonight (Friday): Periodic rain, lows near 50. Saturday: Drizzle, a shower, highs in the 50s.